So I was delighted to have the opportunity to see my first West End show in a year(!) on my first weekend back in England. Thanks to director Gordon Greenburg, who was also the director for ‘Tangled: The Musical’ which I was performing on the Disney Magic, I was able to see his latest show, ‘Guys and Dolls’. Having originally been produced at the Chichester Festival Theatre last year, due to great reviews and high demand, the production uprooted itself to The Savoy Theatre in London for a longer run, with new cast members. Leading the cast are Sophie Thompson and David Haig, as Miss Adelaide and Nathan Detroit (who you may recognise from the classic film ‘Four Weddings and a Funeral’), and Jamie Parker and Siubhan Harrison portray the unlikely pair of gambler Sky Masterson and missionary Sarah Brown. 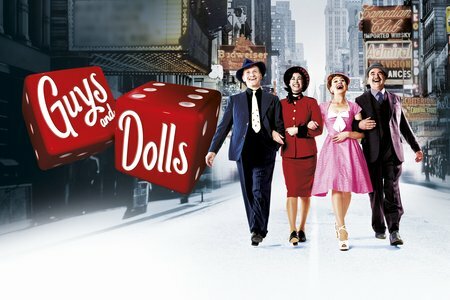 From the moment the classic trio ‘Fugue for Tinhorns’ began, I was quickly reminded how many classic songs fill this show and how ‘Guys and Dolls’ really does stand the test of time. As each musical number began, I realised just how many songs from this show are well-known standards, and how fun and fabulous the songs are! From the classic love duets such as ‘I’ve never been in love before’, to energetic ‘Luck Be a Lady’, to Sophie Thompson’s hilarious rendition of ‘Adelaide’s Lament’; every song could have had the whole audience singing along, if that were not a sin to all theatre-folk. But the real showstopper proved to be Act 2’s very own ‘Sit Down, You’re Rockin’ the Boat’, which literally had the actors frozen on stage for a good amount of time, whilst the audience exploded with applause. The script is witty, the actor’s banter is fresh and humorous, and the chemistry between the lead couples is infectious. Mixing in these acting elements with the slick, high energy dance numbers, and the great music, makes for a perfect night at the theatre and I urge anybody in London this New Year to fit in a trip to The Savoy Theatre! The show is running in London until the 12th March 2016 and then will be touring venues in the UK for a limited run.